GEELONG captain Joel Selwood has been cleared of striking Lindsay Thomas, who himself was hit with a three-game suspension for bumping Cats midfielder Scott Selwood. Selwood struck down his striking charge in one fell swoop, arguing two points but eventually requiring neither. The AFL Tribunal deemed Selwood not guilty of striking Thomas following a heated and colourful hearing. The verdict eradicated any need to consider the Cats skipper's challenge to the grading of intentional and that impact was low. Selwood, 29, said he set his sights on Thomas after the former Kangaroo wiped out Scott Selwood - whose brother said he was not aware his younger sibling was involved - to "deliberately tell him it was a f---ing dog act". He managed to do just that, he confirmed, "when I was standing right over him, getting pulled to ground", with the Cats counsel highlighting that what he had approached Thomas to say "he is not particularly proud of". Selwood had argued that the strike was careless and that the impact was negligible. And after arguing that he was off-balance, dragged down by Thomas and bracing himself to fall in the action, the Tribunal - which was also showed vision indicating Thomas bore no symptoms of a strike - was convinced that Selwood had not struck Thomas. 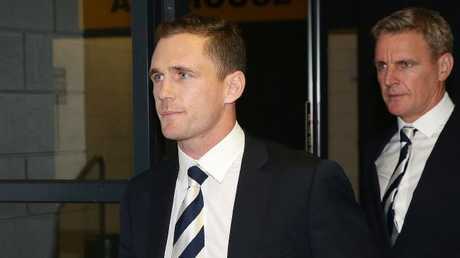 "I'm pleased to obviously get to plead my case tonight and have the opportunity to do it," Selwood said after the colourful hour-long hearing. "I'm really looking forward to taking on Sydney this weekend." 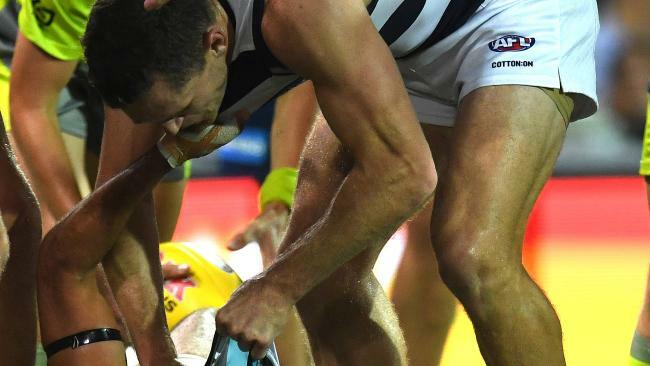 Thomas' high and severe hit on Scott Selwood in his first game for Port Adelaide added three weeks to a separate one-match ban for striking from Saturday night's loss to Geelong at Adelaide Oval. The former Kangaroo pleaded guilty to rough conduct via video link at the AFL Tribunal last night, as his counsel fought for a three-week ban. 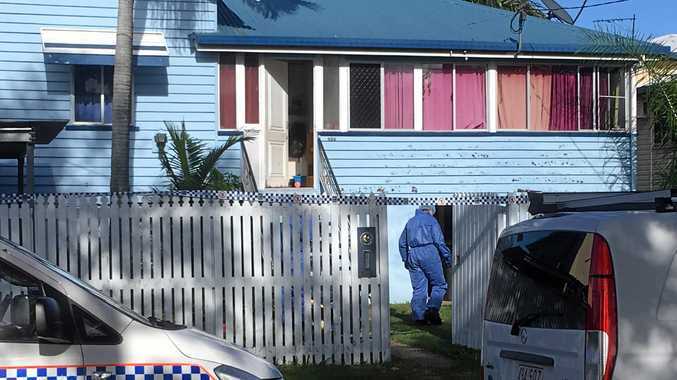 Thomas, 30, did not dispute the charge that was deemed to be careless, severe impact and high, though his counsel argued that the act was "at the low end of severe" and "marginally over the line" between severe and high impact. The AFL had argued for a four-week penalty for Thomas - plus the one-match ban already accepted - but his advocate Ben Krupka was firm that three weeks was appropriate and highlighted the ex-North Melbourne midfielder's playing future as part of his argument. "He is a rookie-listed player … on a one-year contract," Krupka said. "The incident that we're here for arose in his first game (for the Power), and there will be an additional game to be added. "Even if our submissions are accepted, it will be a four-game suspension. Port Adelaide has a bye in Round 10 - he would be out of action until Round 11. "The reality is, he'd play two SANFL games this time, the likelihood is that he'd have to play more then. Anything more than three plus one has the potential to be crushing for his chances of playing AFL again this season. "For those reasons, we submit that three is the appropriate penalty in this case." Thomas - who was not required to give evidence given his guilty plea - expressed his remorse and determination to bounce back after his ban. "I hope Scott is OK - I didn't intentionally go out there to hurt him," he said. "I hope he's OK. "I'll just work my backside off for the next four weeks. "I want to apologise to my teammates and obviously the footy club - they've done so much for me in the last couple of months to get me home. I want to apologise to them and I'm going to move on from this and come back."